Watch the new video for Lamar’s DAMN. single. Shortly after performing with Rihanna at the annual TDE Christmas concert, Kendrick Lamar dropped a new video for his DAMN. single "LOVE." The visual, like that of "HUMBLE" and many other Lamar singles, is directed by Dave Meyers and the Little Homies. It captures the highs and lows of a relationship, from tender moments to blazing rows and the moments in between. Check it out above. 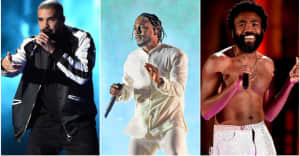 Lamar, who is nominated for seven Grammys at the 2018 ceremony, will tour Europe in the new year.